In the spring and fall it holds a feeder that's enclosed but accessible under the top without opening the hive. In the winter I use the screened box with wood chips around it and sheets of burlap on top. I can lift up the burlap and pour some sugar inside the screen for some extra winter feed if they want it. The vivaldi has screened vents front and back. Here in the pacific NW (Portland area) dampness is the problem. I had 1 of 2 make it last winter, hoping for 2 this year. Earlier I had some condensation inside under the top so I put a small twig under the back of the cover to lift it up a little for more ventilation. I also have 3 ft sq covers on top of the hives to keep the rain off the sides. We have 3 area bee clubs that are great sources of info and support. Here they're under OSBA (Oregon State Beekeepers Assoc). Thanks very much! I will look into that. It sounds nicly designed with the dual purpose. Our next County Bee Club meeting is the end of the month. I can also post for advice on the club website. Don't know why I forgot about this. I'm actually on the Club executive board even though I'm a novice because I keep the clubs extractor at my house and rent it out for the club. In my class and two years of going to meetings, I've never heard (or don't remember) discussion of winter humidity issues. Of course there are so many things to learn about bees, that until I experience the issue I might not always remember it. Our air is very dry here generally in the winter. I am unusual to have hives right by a pond. Though moisture is a factor, once the colony dies, moisture will condense in the hive on its own accord. Seeing so many die in November seems to point to a severe mite issue. The easiest way (and doesn't harm the bees) to test for mites is the sugar shake. You gather a bunch of bees in a mason jar with powdered sugar, put a screened lid on and coat the bees in sugar. Then dump out the sugar onto a white paper plate and count the mites. If you have more than 2 you have a mite issue, treat however you want (oxalic acid works great but you have to treat over 16 days, it is just rhubarb leaves). SO Marc, What happens when bees are killed by excessive dampness? What do you observe? David, Mites are the most likely killer of bees I know. I've never done a test for mites. I admit, mite treatments seemed very complicated to me as a new beekeeper with all the other new information to digest. 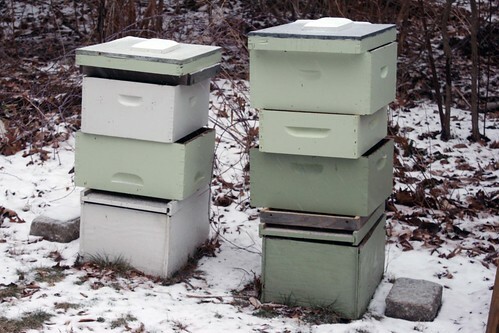 I spoke with a couple large scale beekeepers about my hive losses yesterday at our regional bee club executive meeting. (I keep the club's honey extractor and rent it out for the club, so even though I'm a very inexperienced beekeeper I'm asked to attend executive meetings.) They were very surprised to hear my experience: bees dying en mass in piles in the hive. They find that bees killed by mites disappear and don't die in the hive. Actually Rick (NEBees) shook his head and didn't know what to think. Like you, they weren't inclined to blame condensation. There does seem to be a larger bee die off than usual this fall/winter. Rick said his bee package sales are selling out faster than usual this year. Other bee keepers at the meeting described hive losses. Rick says there's no point to doing a mite test. If you find mites, it's too late. You should have treated them already. He says these days everyone should be doing mite treatments. OK, so I wasn't treating. But given that, he has never seen what I described. I got 90 lbs of honey last season from this big hive. 40 lbs this week after disassembling it. No one had heard of bees dying and just dropping on the floor of the hive. So, next year I'm thinking maybe I'll move one hive to higher ground and start up mite treatment and tests. I'm still figuring out what is the best strategy.